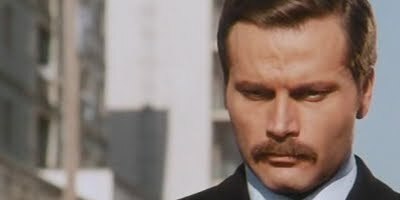 District Attorney Traini, Franco Nero, is called to investigate some shady dealings involving the botched assassination attempt of a mafia boss named Ferdinando D'Ambrosio, Luciano Catenacci, and the involvement of Police Captain Bonavia played by Martin Balsam in said assassination attempt. It's no secret that Bonavia freed a patient at a mental institution and used him as his personal tool to eliminate D'Ambrosio, considering this is all revealed in the opening scenes of the film. However, as the investigation ensues, the question is raised as to who the real bad guy is, and a commentary is made on the influence that the mafia had over everything and everyone. Is D.A. Traini the bad guy for seemingly siding with D'Ambrosio throughout the investigation, or is he merely doing his job and giving the "victim" of this particular investigation a fair shake? Is Captain Bonavia wrong for taking justice into his own hands and disregarding the judicial system which may or may not be corrupted, or is he doing the right thing by attempting to eliminate the cancerous mob and risking it all to take a stand for the people. Perhaps there are ulterior motives for everyone involved. There's a lot going on in Confessions Of A Police Captain, so those looking for a sleazy, shoot-'em-up of a Eurocrime movie with car chases galore, might want to look elsewhere. Others, however, who may be looking for an effective, albeit long, cop drama that demands repeat viewings, need look no further. The film features a great score by Riz Ortolani, a solid performance by Franco Nero, although some credit should go to the person who dubbed his character, and a show-stealing performance by Martin Balsam. Low on the violence and heavy on the dialogue, and with an intriguing story and complex plot to boot, Confessions Of A Police Captain is a movie that will no doubt appeal to fans of crime dramas and police procedurals.